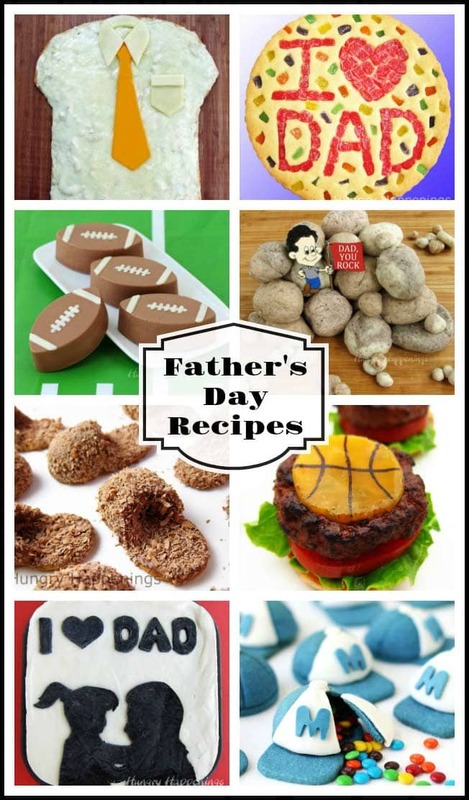 Father's Day Cookies - Chocolate Sandwich Cookies Imprinted with "DAD"
June 3, 2017 By This post may contain affiliate links. 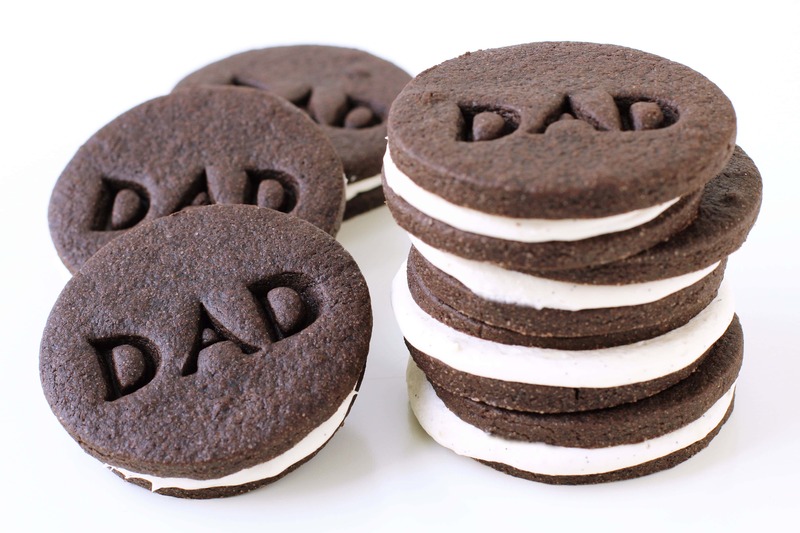 Surprise your dad this Father’s Day by making him a batch of homemade chocolate sandwich cookies filled with marshmallow cream and imprinted with “DAD” on top. These Father’s Day Cookies will make a great dessert or gift. Are you looking for a special dessert to serve with dinner on Father’s Day or perhaps a unique gift to give your dad? I bet your dad will love it if you make him these cookies. Each dark and decadent chocolate cookie has an intense chocolate flavor which is balanced by the sweet marshmallow filling. Each cookie can be personalized with the word, “dad” or any other message you’d like to add. The chocolatey cookie dough is easy to make and roll out. Once you cut the cookie dough into circles then use plastic stepping stone alphabet stamps to imprint “DAD” or any other short phrase onto the cookies before baking. Whip up a simple marshmallow filling to spoon in between two of the cookies or serve them plain. Either way, these cookies make a great treat for Father’s Day. Head over to Dixie Crystals to see the recipe to make these Chocolate Sandwich Cookies with Marshmallow Filling. You can find the garden stone stamps at craft stores or from Amazon.com (commission earned for sales). 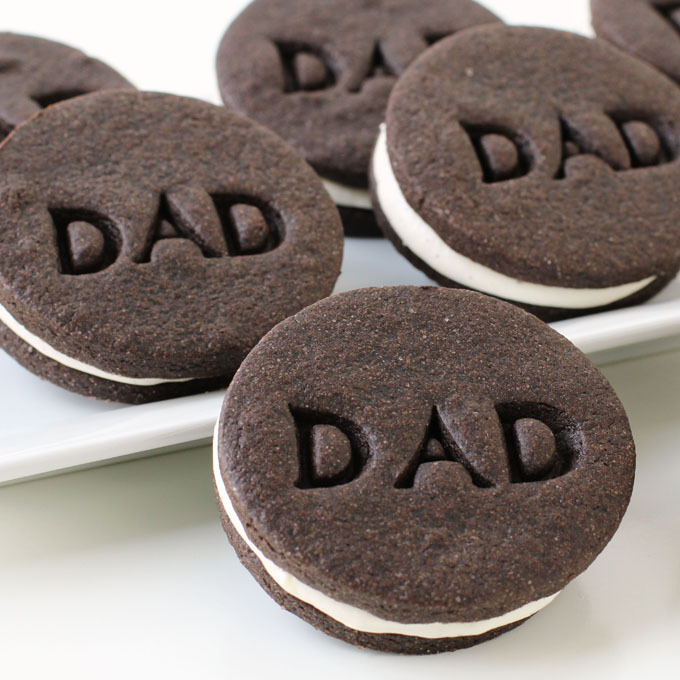 Use the larger stepping stone stamps if you are adding “DAD” to your cookies or use the smaller biscuit stamps if you want to add a longer phrase to your Father’s Day Cookies. Thanks! These cookies definitely could be stamped with “MOM” too!